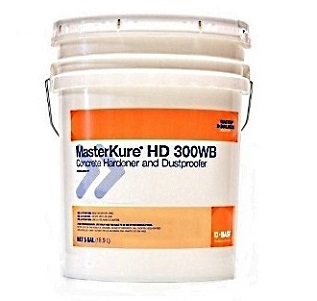 PRODUCT: MasterKure HD 300 WB (formerly Lapidolith), Concrete Hardner and Dustproofer. 5G Pail. Price/Pail. DESCRIPTION: MasterKure HD 300 WB is a magnesium flurosilicate concrete hardener and dustproofer that bonds chemically with the concrete to strengthen and harden floors that are porous, readily absorptive, and only moderately hard. YIELD: 100-300 sqft/gallon, depending on concrete density. Concrete Hardener -- tightly bonds together the cement, sand and aggregate particles to product a dense, abrasion resistant suface resistant to most acids, alkalis, chemicals and oil/grease.